Is it sad that this should be addressed? 1. You should have you Photo ID (Passport, Driver’s License, State ID, Visa, etc.) in an easily accessible place when you get to the counter or the kiosk. Do not loiter and waste everyone’s time searching for your documents. 2. If you have a question, and you know you have a question, DO NOT USE the Kiosks! 3. Weigh your bags before getting to the airport/before going to the counter. There are places at some airports where you can do this. This way you can take things out prior to checking your bags in. 1. Do not put that identification information deep back into your bags! You’re going to need it again. So have it out and ready when you get to the TSA Officer. 2. There are resources to see what you CAN and CANNOT bring on a plane in your carry on. If it’s any sort of liquid (and yes, that does mean makeup, ladies,) it has to fit in your Quart-size bag and under 3.41oz (100mL). Any questions, PLEASE use this link. You know that you have a bag full of liquids. Please keep this at the top of your bag or in a separate easy-to-access bag so it is easy to access when you take it out of your carry on and place it in one of the bins. Laptops. Take them out. Put them in their own bins. Sweatshirts/Coats/ any oversized clothing NEEDS to be taken off! This also includes belts, shoes (unless you are TSA Pre-Check), watches, and metal objects. I have a lot of piercings. Those do not need to be taken out. Sometimes large earrings do. I also wear a set of military dog tags–I ALWAYS have to take them off (because they’re metal). 3. If you are pregnant or have any medical devices or metal plates, please advise the first TSA Officer. They will direct you to the appropriate line, and/or they will tell you who to speak with. Going through TSA does not have to be a guessing game. 4. After you have passed through screening, grab your things, take the whole bucket if you need to, to the “end zone”. There are usually chairs and an open area, where you can go ahead and get yourself settled, re-dressed, and your things back to where they belong. (From us Milwaukeeans, we call it the Recombobulation Area.) Do not do this in the line. I’m trying to grab my things. Could you please put your belt on elsewhere. Now we’re clogged. We have to hold the screening line so the 6 of us behind you can grab our things too. 1. Moving sidewalks? Escalators? In the US you stand on the right, so others can pass on the left. Don’t take up the whole area so people are stuck behind you. Please! 2. Your bag does not need a seat of it’s own. Please do not put your bag on the chair next to you. If you haven’t noticed, there are not enough seats for everyone at the gate. I only travel with carry ons. I have my Osprey Backpack, along with my Tortuga or Camelback backpack. Strategically, I place my Osprey back pack under my seat with my legs through the straps, and the other backpack on top or on my lap. Boom. Not taking up aisle space, or the seat next to me! Easy! This also means your water bottle and garbage doesn’t either. Even worse… do not find a row and lie down. Don’t think you’re going to get a nap with the number of people who will be coming over and asking you if those seats are taken. 3. Pick up after yourself. There is no Rosie (from The Jetson’s with a vacuum cleaner as soon as you drop a crumb). There may be 3 more flights departing before a cleaning crew comes. No one wants to sit in your filth. And there are people in the airport who WILL call you out, including the Gate Agents. 4. Did you know that it is okay to not talk to your friends/family for a few hours? Don’t be that person shouting on your phone or to someone across the airport so loudly that the flight attendants on the airplane can hear you. Even, shouting to the person sitting next to you. Also, stay off of Face Time, Skype, Snapchat calls, etc. Really, no one wants to hear your conversation. 5. Getting in line. Ugh. You’re in C Boarding? Oh cool, let’s line up for A boarding, and not let anyone be able to get through to get on their plane during their boarding zone. Let’s make sure we’re not already lined up and blocking people. There’s no reason I have to walk around the whole gate zone just to get around you, to get on the plane. This is where Southwest Airlines has done it right! I am a fan of the way they board. Granted, I do love having an assigned seat, but I used to fly standby, so I’ll sit in whatever seat is left. But I also don’t have a problem sitting in the back of plane. 6. Be courteous. Yes, I know, you don’t have to give your seat up. But if we all did something kind for someone, during a time which can be super stressful, we’ve done our job as a human being. Those who would love a seat: elderly, disabled (sometimes there are not enough seats for them, if any), pregnant women, parents with their hands full of kids, etc. (I’m sure there are others that may need a seat). 1. You go through those beloved doors individually and line up while you wait to get on the plane. So why in the world are you trying to cut in front of me? There’s a difference between merging to get on the airplane, and deliberately cutting in front of people. This one doesn’t irritate me as (because I’m still going to get on the plane) much unless they run over my foot. I watched a man cut around a woman and her toddler and knocked the kid over with his rolling suitcase. 2. Putting you carry on, your personal item, your coat, your umbrella, your shoes, your sweatshirt, your newspaper, your duty-free items… in the overhead bins. Please, just don’t. There’s not enough space to begin with. So let’s not put everything in there that can be in your area. 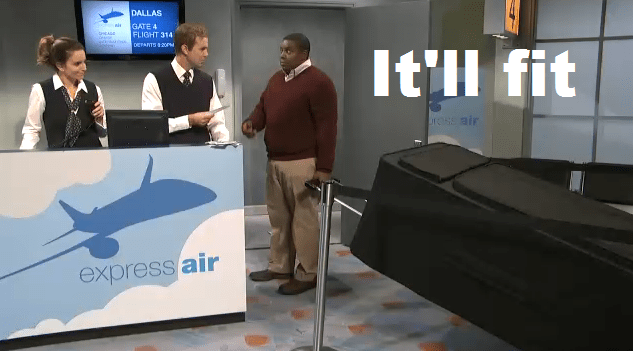 If you have trouble lifting your carry on bag into the overhead bin. It may be too heavy. Don’t assume someone will put it up and take it down for you. This includes the flight attendants. Some airlines do not allow the FAs to lift bags, no matter how light the bag may be. So let’s not be snarky and telling the FA it’s their job to help you. Have the things you’re going to use on the plane in an easy accessible pocket/area/bag. Let’s not hold up the line while you try and find that external battery cable at the bottom of your carry on while people are wanting to sit down. Yes, we all are going to get on the plane and sit down. But, did you know airlines get fined if they are not out of their gate at a certain time? Who reeeeeally ends up paying for it? That next ticket you get may be $800.00 instead of $300.00. 3. You know what you should do before you get on an airplane? Go to the bathroom. You know what you should not do when people are boarding? Go to the bathroom. 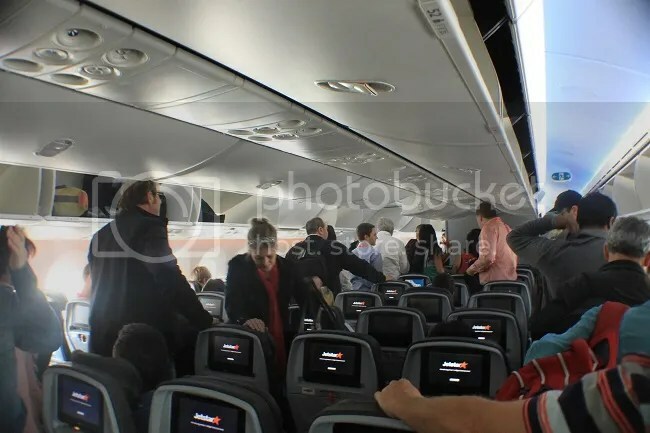 You know what you should definitely not do when everyone is seated, seatbelt light is on, the FA’s are doing their inflight announcements, and the plane is taxi-ing? Go to the bathroom. Was I clear? 4. Do not ask a FA to get you a beverage, snacks, pillow, or to throw away garbage for you. Can we please get on the plane and get in the air already!? 1. Do not select the window seat if you have a small bladder. I understand if you need to go to the bathroom once, maybe twice. On an 8 hour flight. But if you need to go about 16 times please asked to be moved. That’s one to two people you are inconveniencing. And if you wake me up to go to the bathroom one more time, I might actually kill you. And when the drink or food cart is coming past, can you make sure you go to the bathroom when it’s past your row and you’re going in the direction that they are not. You’re holding everyone up, when somehow you think you can shimmy through. 2. Please stop pressing the call button to have a FA come over every 5 minutes. I sat next to a man who called the call button every 8 minutes of an hour to ask the FA questions like, “where is my next gate?” and “how fast is the plane going?” and “why don’t you offer free food?”. Every time the FA is going past, you grab, touch, or hand them something. They are not your personal assistant. You are able to press your call button if they didn’t hear the “Excuse me ma’am/sir” you addressed them with. I just thought I would add this one due to a lot of my friends being Flight Attendants. I just see people grabbing and touching them. My first instinct is to swat their hands away. I did see one FA hit a man’s hand and advised him to push his call button next time he needs something “because I will alert the authorities if you grab me one more time”. Get it girl! 3. Hygiene. Please shower, brush your teeth, put on clean clothes, AND deodorant. You’re in close quarters. Also, be watchful of how much perfume and cologne you’re wearing–and please do not apply on the aircraft. Some people are allergic to smells. 4. Keep your shoes on! (Also, keep your socks on!) No one wants to smell your stinky feet. As well as, sometimes your feet can swell on an airplane. Just like when someone sprains an ankle, until you can treat the area, the best thing is to keep your shoes on. You wouldn’t want to make it to your destination and not able to fit your shoe/boots back on. Please don’t air your shoe out with the air conditioning.. that’s disgusting. He knows exactly how I felt. I’m still grossed out. 5. Food. Please do not bring curry on the plane with you. Or a freshly cooked blood sausage. Even garlic mashed potatoes. Which I love. If the airplane does not provide food, which is more common than not. Please stick with faint to odorless food. Like carrot sticks, or some sort of low-odor sandwich. 7. Planes are tight. Please do not hog the arm rests. I have seen people battle it out. And I will fight for some of it as well. Common Space Rule. 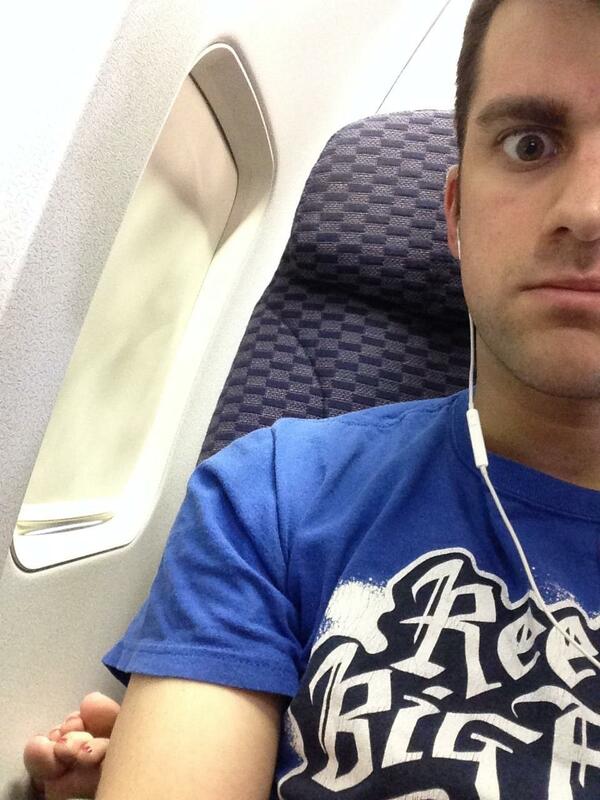 If there is an empty seat between you and your row-mate. It is perfectly acceptable for both of you to use it. Do not hog all of it up with your garbage and stuff. 8. Remember that planes are tight? Let’s be polite about reclining the seats all the way down. There really is no need for that. But now you have my screen at my chin and I have no room to lift my soda to my mouth. So now we have a chain reaction, where now I’m the jerk because I recline my seat also, so I have some space in front of my face. I try really hard not to recline. I can sleep with it being upright The worst is when we’re trying to eat. Most flight attendants do ask people to raise their seats to their upright position during meals, however, some do it, and then immediately recline back when they leave. My patience is quite low for those that do that. And I did see a man’s soda spill all over his khaki pants. Also, please try and use the armrest when getting up (unless you really need to use my seat for leverage–some people have more difficulty than others, I understand, my father is one of those that may also need to use your seat to get up), but when you do that. PLEASE watch your hands so that you don’t end up pulling my hair out! 9. This one is for the men. Your legs do not have to be spread out that widely. You have that little space in front of you, do not take mine, I will remove your body from my area. And I have no shame spreading my legs just as wide as you have yours. Lady or not. 10. Use Headphones. I don’t want to hear the noise from your cellphone for that game. Or you listening to your music or movie from your computer/iPad/cell phone. 1. Seat by Seat, Row by Row. I watched a man from the back of the plane run to the front of the plane to get off first. I sit in the window seat. I have two people getting off the plane before I can get to the aisle to grab my bag. I see you Aisle Man from the row behind me trying to cut me off. I’m really quick at grabbing my bag and getting off. There’s no need to try and push past me. It’s called consideration. Also, I’ve been one of the last people off of the plane and when I got to the baggage carousel I was still waiting for my bags. 2. If you have garbage that wasn’t picked up you have two options. Take it with you or place it on the seat and the FA will pick it up while they’re cleaning. There’s no reason to hide it in the seat pocket. If you can’t see it, you can’t remove it. So the next person gets a super cool surprise when their book now has gum and a wrapper stuck to it. 2. Please watch where you’re swinging that thing! This man had this massive suitcase, and I mean, it didn’t look much smaller than the suitcase pictured above (obviously smaller, but wayyyy bigger than a normal large suitcase). He must not have had anything in there because the man grabbed it with ease. However he swung it and hit the lady behind him and she went flying. It was the most hilarious thing I’ve ever seen–of course it was only funny after we checked on the lady and made sure she was alright. But then again, there’s no reason to crowd to the front of the carousel. Some people may need some extra space to get their bag. I don’t check bags very often. But I know it’s not always easy to grab your bag off of the moving carousel. Just keep in mind of people around you. You have it grab it with full force and bring it in front of you–as to not injure people. If you let your child grab it, you should be there for backup.